My daughter is turning 6 in a few weeks. When we took her to the story a few weeks ago to get ideas for her birthday, she spent more time looking at the stores brand of American Girl Dolls. She wanted everything! Then we received an American Girl Doll magazine in the mail with all their fun products, that will make any woman want to be young again. She googled and starred at each page with excitement and make believe in her eyes. I gave her two Madame Alexander doll a couple of Christmas's ago. I think I spent $24 for the pair of them. I loved them! She loves them! I love their faces so much better than the American Girl Doll ( the teeth freak me out) and their price is better on my budget. I made her a bunk bed that was absolutely adorable, but I don't think I realized what I had introduced her to. I am aware now! The money that a person could spend on these dolls and their accessories is nothing short of amazing. With a limitless budget, a person could easily create an entire 18 inch world. I felt horrible as I repeatedly told my daughter no to each thing she wanted. The store prices were significantly better than the catalogue, but even at those prices we could only buy one or two items. Since I make most of the cloths (see my etsy store), she really only wanted the big items. This started a very feverish search on Pinterest. I had a chat with my three boys and we decided to try and make her a bunch of things, rather than buy things. So get ready! Every doll needs a place to sit and relax, so we will start there. I was given a large piece of foam from a friend. One of those bed roll types. I almost gave it to goodwill after constantly throwing it out of my craft area, but couldn't bring myself to do it. Foam can be used for so many things. Then I had this idea. The foam wasn't thick enough so I knew I would need to glue pieces together. I cut out some pieces of paper as my guide to the size the doll would need. Then I cut out the foam. 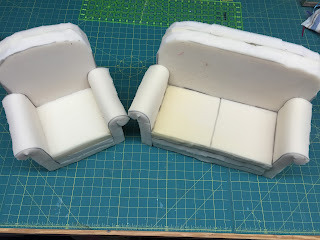 Three pieces for the seat part, two for the arms, and two for the back. Using spray basting glue, I sprayed both sides that I wanted to touch. Let it dry for a minute and then put them together. I used this technique for every spot I needed to glue. Spray both pieces, let dry a minute and become tacky, than firmly press together. For the arm, I just rolled the top down about and 1- 1 1/2 and glued. I cut some curved edges for the back and then glued it on after the arms were secure. After stacking the three bottoms pieces the arms attached to them, with the rolled edge facing out. I cut some rounded corners on the back pieces after they were glued together. Gluing the back onto the chair was the last step. I am pretty happy with the way it came out! For the couch I just lengthened the bottom and the back to make it longer, but used the same process to put it all together. Stayed tuned for the next post to find out how I covered them!